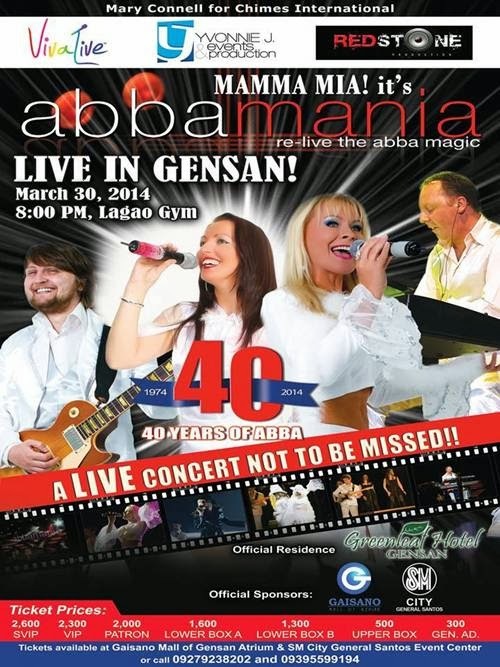 ABBAmania, the hit ABBA tribute band from Europe which have already taken the wonderful music of ABBA to different countries in the world will be doing a concert in General Santos City on March 30, 2014. Re-live the magic of ABBA and hear once more their timeless hits such as Mama Mia, Winner Takes It All, Thank You For The Music, Chiquitita, Fernando, Take A Chance On Me, and the global anthem, Dancing Queen. The ABBAmania Live in Gensan will be held at the Lagao Gym. Tickets are priced on the following rates: SVIP- Php 2, 600, VIP- Php 2, 300, Patron- Php 2, 000, Lower Box A- Php 1,600, Lower Box B- Php 1,300, Upper Box- Php 500, and General Admission- Php 300. Buy your tickets now at Gaisano Mall of Gensan Atrium or at SM City General Santos Event Center.